An NFet as a low side driver and a diode across the coil and one is good to go! Unless, of course, the small, 3 V, SMD PCB mountable, small signal relay's coil is polarized! As far as I can recall, none of the relays I've every used before had a polarized coil UNLESS they had an internal diode, which this one doesn't. Unfortunately, I missed the small (+) and (-) signs on the relay's pinout diagram, and Murphy's Law being what it is, I laid out the wiring to the coil "backwards". I couldn't figure out why the relay wasn't switching! I swapped out the NFet to no avail. I tested another relay and it switched fine on 3 V.
I went and studied the data sheet and then I noticed the polarity markings, and sure enough, when powered correctly, the little relay switches just fine. I assembled five PCB's for this project, and I had to destructively remove the five relays and do a little surgery on the PCB's this afternoon, to swap the coil drive signals for the new relays. The small tan rectangular relay shows the coil pins insulated from the PCB with electrical tape, and jumper wires crossed over and connected to the coil's diode. And yes, I broke down and used a SFE breakout board for the LIS3DH accelerometer as I didn't wish to attempt soldering it. The Relay is a NEC EE2-3NUX, (non-latching, just a simple DPDT relay). I'm a little bit smarter today, as I learned about polarized relay coils, even when there is no internal diode. Some lessons are more painfully learned than others. Edit: Relay Pinout is for the EA and EB series, my is the EE series, but the concept is the same. I think adding the magnet makes it easier to "move" the relay, so less power is needed...but you need to work with the magnet, not against it! Relays are classified into the following types, depending on whether or not they have a permanent magnet. Non-polarized relays do not use a permanent magnet in their electromagnetic section. This means that generally the operating coils do not have polarity. 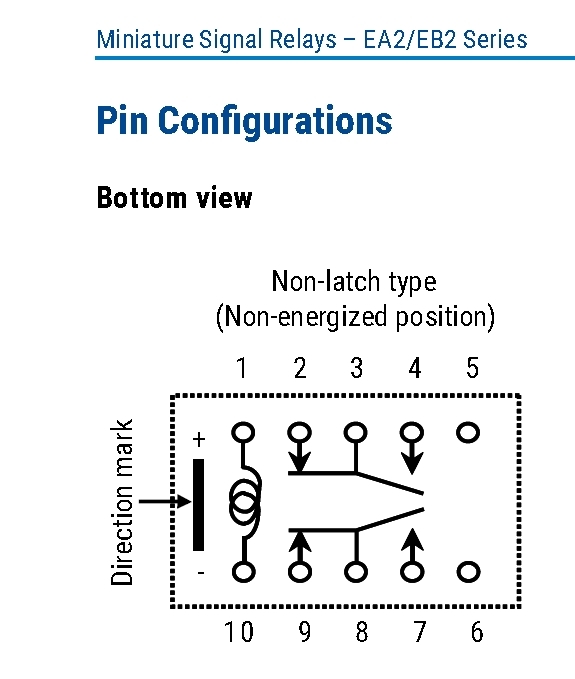 There are some non-polarized relays, such as those with built-in operation indicators, or surge-absorbing diodes, whose operating coils have polarity. Are those 3 buzzers on the board (black with hole)...wondering why there would be 3? I have a similar relay on a board that I'm current working on, and after seeing your post, I just checked my board. I made the same mistake! Considering the number of undocumented gotchas a design has to work around, when I see polarity marks, I do my best to humor the maker. The datasheet's minus marks, at least how how they render under OSX, could have been a lot wider – at least an en-dash. I like how the marks have only somewhat less emphasis as the coil. Hmmm. The first point of the "Driving Relays" section does not really help. All the relays covered in the EA2/EB2 datasheet are polarized. Why include the "If ..."? If one is good, three is better, right?! 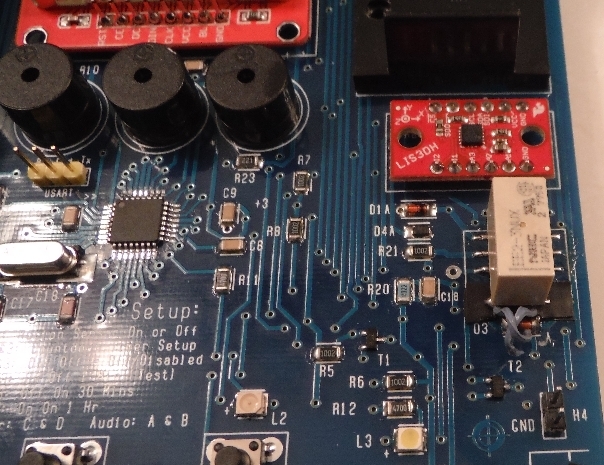 The board is for training purposes, and the extra piezos are just there to increase the audio volume without using an amplifier chip and a speaker. I want to make sure I get everyone's attention, when so needed.